We mark World TB Day each year on March 24th to help bring attention to those affected by TB, and remind the world that despite being a curable disease, TB is currently the leading infectious disease killer, and responsible for 1/3 of all deaths for people with HIV. World TB Day is an opportunity for people everywhere to join this fight by helping to educate others about TB and by urging governments to take action. We believe that together we can end TB once and for all! 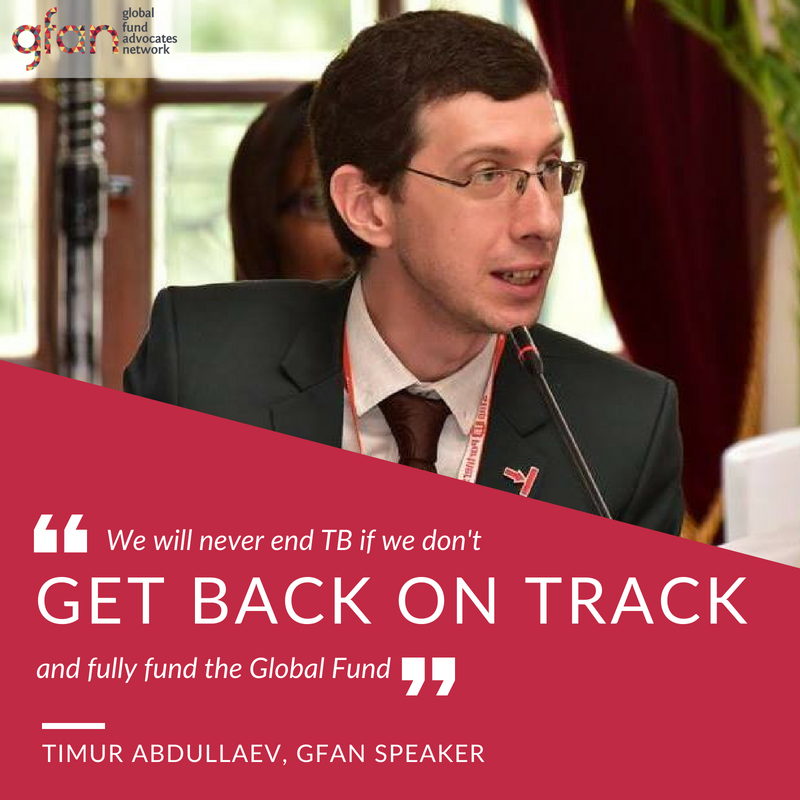 The Global Fund provides more than 65 percent of all international financing for TB and they have disbursed more than US$5.9 billion as of the end 2017. In 2017 alone, 5 million people with TB were treated including 105 thousand people with drug resistant TB. 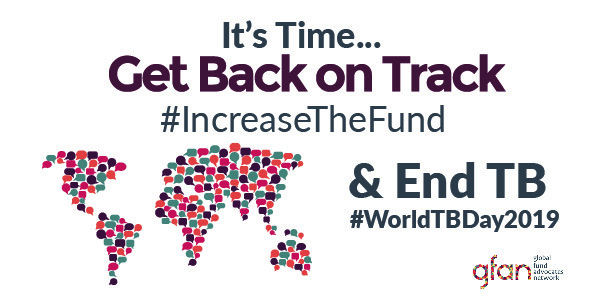 We need strong investments in the Global Fund: more than the US$ 14bn is essential because the majority of the 17.8 billion gap between the Global Fund’s ask as well as other assumed resources (bilateral funders, domestic investments, etc) and the total need to fund the 3 diseases in Global Fund eligible countries, is in investments in TB. And yet, the Global Fund’s Investment case indicates that with the minimum $14 billion investment, it can meet 91% of the TB HLM treatment target by 2022 by providing 31 million people living with TB with first line drugs and a further 1 million with second-line drugs between 2018 and 2022). The Global Fund is working with partners to integrate TB screening into other routine check-ups, engage private health care providers who are diagnosing and/ or treating people with TB, and develop more efficient ways to ensure those cases are reported to national TB programs. The 6th Replenishment of the Global Fund is the first test of the Political Declaration committed to at the UN HLM on Tuberculosis in September 2018. The Political Declaration symbolizes the global momentum toward our common goal of ending TB, but it is only a starting point. With increased funding and resources we can achieve almost 91 percent of the first and second line treatment targets adopted at the UN High Level Meeting on Tuberculosis in 2018. Most donors have little or no bilateral funding for TB programming compared to the size of the need; the best way for donor countries to quickly scale up support for TB is through the Global Fund. For example, early results from a Global Fund supported initiative to find and treat 1.5 million “missing” TB patients by the end of 2019 has already had great success in 6 high burden countries in Asia where they have already found nearly 1/3 of their goal. Meeting the targets set out by the political declaration would be a truly momentous step in the right direction, the Political Declaration reflects only the bare minimum that will be required to get ahead of the TB epidemic. It is time to get back on track and invest resources for treatment and prevention of TB and support for those living with and affected by TB. One of the best ways to do this is with strong commitment and significant investments in the Global Fund. Donors and implementing countries need to step up the fight, invest in the Global Fund and honour their commitments made at the UN HLM to end TB. In addition to the materials and campaign tools provided by StopTB (they have a great toolkit here with customizable tools to support this year’s “Its Time to End TB” theme), below you will find some additional resources you can use around World TB Day to showcase the critical importance of the Global Fund and its replenishment. 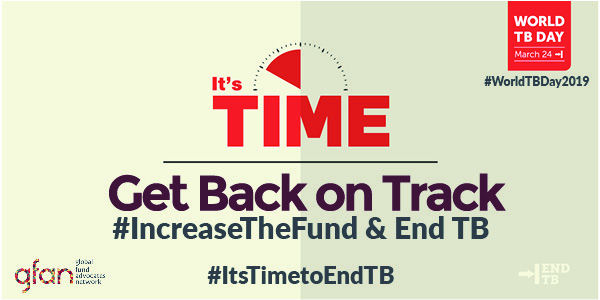 It is time to #GetBackkonTrack and invest resources for treatment and prevention of TB and support for those living with and affected by TB. 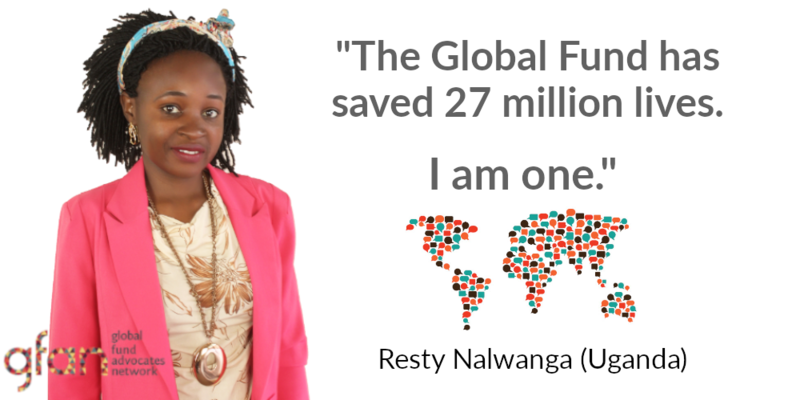 One of the best ways to do this is with strong commitment and significant investments in @theGlobalFund. Donors and implementing countries need to step up the fight, invest in the Global Fund and honour their commitments made at the UN HLM to end TB.